Activists hold a protest outside Department of Agrarian Reform in the national capital to condemn the massacre of 9 farmers in Sagay, Negros. Photo by Anakbayan used with permission. Nine farmers, including two minors, were killed on October 20 in Hacienda Nene, Sagay City in the central Philippine island of Negros in what could be the single most deadly attack against peasant activists under the Rodrigo Duterte administration. A fact-finding mission  led by human rights and civil society groups have pointed fingers to members of the Special Civilian Auxiliary Army (SCAA), a private militia associated with the Armed Forces of the Philippines (AFP), as the most likely perpetrators of the massacre that is being dubbed “Sagay 9″. Members of the government-backed paramilitary group rained bullets from M-16 rifles on the farmers as they were having dinner around 9:30 in the evening. Most victims reportedly  suffered headshots and three of the dead bodies were doused with gasoline and burned afterwards. The victims are Angeliffa Arsenal, 47; Rommel Bantigue, 41; Paterno Baroy, 48; Marcelina Dumaguit; Rene Laurencio Sr.; Morena Mendoza, 48; Eglicerio Villegas, 36; and the minors Marchtel Sumicad, 17 and Joemarie Ughayon Jr., 16. Three others were wounded but survived. The fact-finding mission took place last October 24-25, 2018, with the participation of the Children’s Rehabilitation Center, Gabriela Women’s Party Congresswoman Arlene Brosas, Karapatan National Alliance for the Advancement of People’s Rights, the National Union of Peoples’ Lawyers, and Salinlahi. 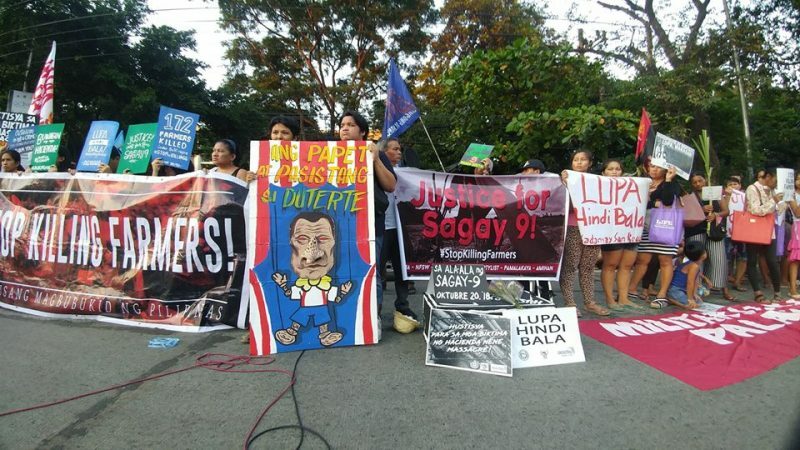 The “Sagay 9” massacre's victims were members of the National Federation of Sugar Workers (NFSW) who were occupying an idle portion of the 75-hectare Hacienda Nene, which the group claims is earmarked for redistribution to farmers under the government’s land reform program. The farmers had just started a “bungkalan”, a collective farming program that serves to assert their claims on the still undistributed land. They began planting vegetables on the day of the massacre in order to help them survive the “tiempo muerto” or dead season in between the sugarcane harvest and planting seasons. According to the fact-finding mission , members of the paramilitary SCAA have been notorious for serving as gun-for-hire mercenaries on behalf of big landlords like Hacienda Nene’s landowner Carmen Tolentino and its arriendador or leaseholder Allan Simbingco. The two are in fact close relatives of Negros Occidental Governor Alfredo Marañon Jr. and Sagay City Mayor Alfredo Marañon III. Negros is known for the persistence of the haciendas, vast landholdings from the time of Spanish colonialism which were first introduced in the island for cultivating sugarcane. Sugar workers in haciendas, on the average, receive a measly P500 to P750 ($9.3-$14) weekly wages all year round. Minimum wage is pegged at only P245 ($4.5) per day for the farm workers but in many haciendas, P80-P120 ($1.5-$2.2) a day is still prevalent. On December 21, 2017, NFSW-Sagay City Chairperson Flora Jemola  was stabbed to death by suspected paramilitary men. Ronald Manlanat , an NFSW member in Hacienda Joefred in Sagay City, was murdered on February 22, 2018. An entire magazine of an M-16 rifle was emptied on Manlanat's head. In the aftermath of the Sagay massacre, government, military, and police spokesmen have all joined together in accusing the Communist Party of the Philippines (CPP), its armed wing New People’s Army (NPA), as well as the NSFW itself, for perpetrating the killings. The Philippine National Police (PNP)  has filed multiple murder cases against Rene Manlangit and Rogelio Arquillo, two NSFW union organizers who supposedly deceived the victims into joining the land occupation as part of a conspiracy to spark outrage against the government. The AFP has claimed that the killing of the nine farmers is part of a “sinister plot ” to oust President Rodrigo Duterte from power. But various human rights and civil society groups have belied this claim, asserting that the authorities are pushing that narrative in order to cover-up its own involvement in the bloodbath. President Duterte himself, in a speech  delivered on October 28, warned farmers involved in land reform disputes from resorting to land occupations, saying he has issued an order to the military and police to arrest and kill all those occupying public and private properties. My order to the police is to shoot them. If they resist violently, shoot them, and if they die, I do not care. Ito pala ang ginawa kong mapa sa cartography class ko. Pinapakita niya kung gaano kalaki yung lupaing nasa monopolyo ng mga panginoong may-lupa at mga korporasyon. This is the map I've been doing for my cartography class. It shows how big the land monopolized by landlords and corporations is. Behind all of these is the everyday suffering of farmers. The state is a butcher of farmers!